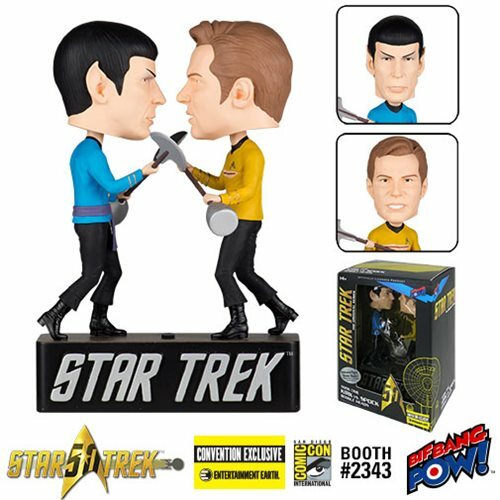 Captain Kirk and Mr. Spock square off in a duel to the death! Taken from the "Amok Time" episode of Star Trek: The Original Series. Entertainment Earth Convention Exclusive! Captain James T. Kirk and Mr. Spock square off in a duel to the death in this spectacular bobbling diorama taken from the "Amok Time" episode of Star Trek: The Original Series. On a Star Trek-themed base measuring 7-inches tall x 4 3/4-inches wide, with lirpa weapons in hand, Kirk and Spock battle and bobble at the head while you look on in astonishment. The extraordinary resin piece from Bif Bang Pow! also includes sound! With the push of a button the music from the fight scene will play. Limited to only 2,502 pieces, each Entertainment Earth Convention Exclusive is individually numbered with a holographic sticker. Sound device includes 2x LR44 (AG13) 1.5v batteries that are replaceable. Ages 14 and up.